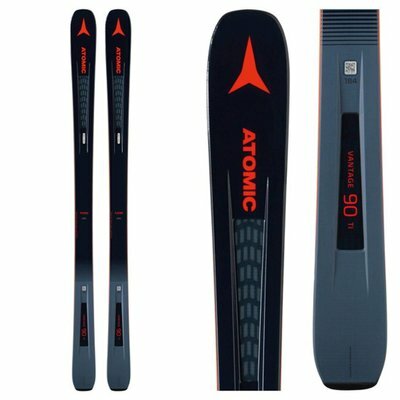 The all new Atomic Vantage 90 Ti will soon have a strong reputation as a highly versatile ski for the strong intermediate to expert skier. This feather-light ski packs a strong punch when you want it to. Atomic's new Prolite Technology uses cut outs in the center of the ski to reduce the total weight of the ski and improve maneuverability. An Energy Backbone adds an extra spring and rebound when you feel like snapping some tight turns on the frontside. The Titanium Tank Mesh uses woven fibers of titanium reinforcements in strategic areas of the ski to enhance an already powerful edge grip on icy slopes. The 90mm waist feels edgy on the frontside of the mountain, rips through the bumps and offers floatation when you get a little bit of snow and need some fresh turns.